Take some scraps of matching or coordinating fabric from your project and decide what parts of it you want to use on your card. 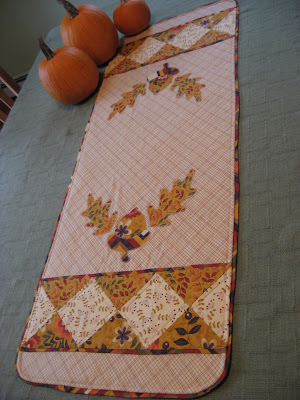 Cut them out leaving a generous amount of fabric around what you want to use. 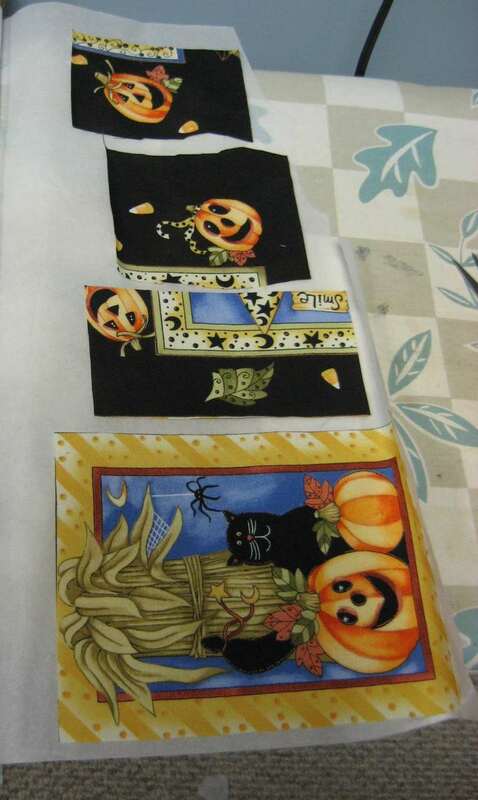 For the card I made Shannon to go with my Halloween Tote Bag, I picked out these cute little pumpkin scenes from the fabric I used as the lining on the bag. Iron pieces of Wonder Under fusible webbing to the wrong side of these pieces, making sure that it extends past where you will cut out your designs. 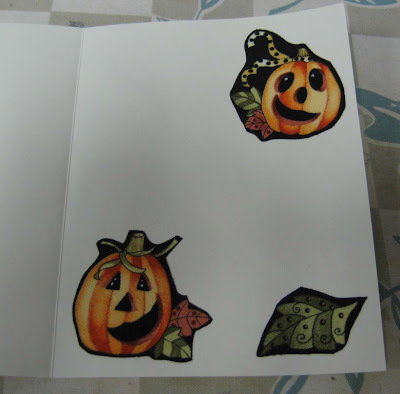 Trim them to the size needed to fit on your card stock. I used ready made blank cards from the craft store. 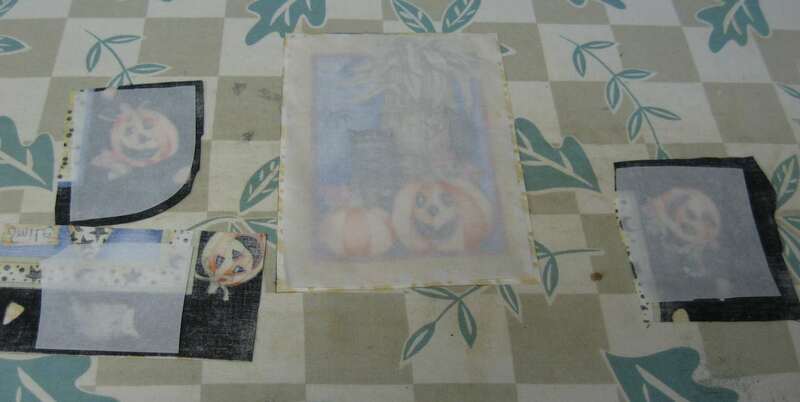 Peel off the backing and fuse the fabric to your card stock following manufacturer's instructions. This little panel was the front of the card. And these cute little guys were inside the card. Write your message and you're finished! You can see this card along with the other things I sent Shannon by popping over to her website and reading about the fun we had swapping with each other. This easy card making method works for picture panels of fabric like I used here as well as for simple quilt block designs or cookie cutter shapes or anything else you can think of. You can also stitch pieces of fabric onto card stock using your sewing machine or by hand if you don't want to use the fusible webbing. 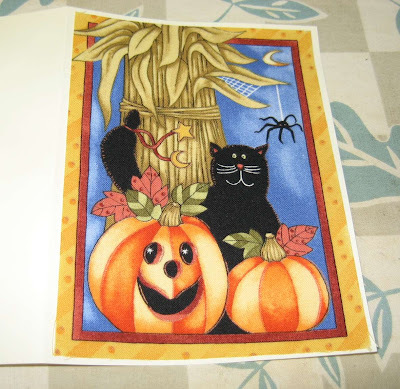 HERE is another example of a handmade card with stitching on it that I made quite some time ago using a photograph, some card stock and some embroidery floss from my stash. You can browse through my Hand Embroidery link at the top of my sidebar to find a few other examples of fun cards to make. Tomorrow is election day here in my state so I will be spending the day at my local polling place doing my little election day job. Since this is a state primary, I expect it will be a very slow day, so I will have to be prepared to keep myself busy from 6:30 in the morning until about 8:00 at night. HERE is another project I worked on at a previous election. I'll be bringing the use-it-up crochet project that I started the other day, and also a pad of paper and pencils. The Secret Santa Christmas Swap is well underway and I have been in touch with the person for whom I will be making something. Ideas are brewing in my head for something nice but I need to do some thinking and planning before I start cutting fabric and sewing. Hopefully by the end of the day tomorrow I'll have a few more blocks crocheted and a good idea of how to proceed on my swap gift. I'll be sure to let you know how it went when I return to my regular schedule on Wednesday! See you then! I love this - I'm in the process of making gift bags for my sister (for her to use when she gives gifts) - I'm using rainbow fabric for the bags, and wanted to also make matching gift tags as a surprise "bonus", but I had no idea how to make them. Now I do - thanks!! 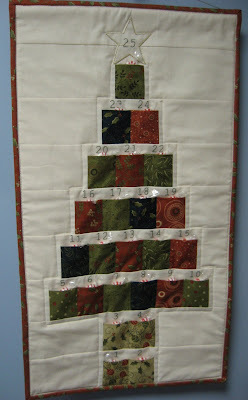 I love doing this - it's fun and easy ... a great instant gratification project! Love this idea. A special card to go along with a special gift! Terrific way to use up small bits of fabric. Handmade cards are a gift in themselves! oh I hope you have been secretly in touch with your partner and she doesn't know who you are??? that is soooo clever and cute!! Thanks for the tut! I absolutely adore this idea! So many times I have leftovers. What a cute way to use them up! Halloween Tote Bag ~ Finished! Happy Halloween ~ just a little early! My Second Summer Afghan - check! Summer's over - but what a summer it was!